Jaswant Modern Sr. Sec. School was founded on 15th, November, 1949, by Smt. 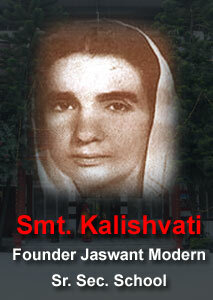 Kalishvati in the sacred memory of her husband Shri Jaswant Rai Khosala, a very pious, highly educated and noble soul. He expired at the young age of 33 years. The Institution was established with the blessings of His Holiness Swami Shivanandaji Maharaj, founder of the Divine Life Society, Rishikesh. The School has produced excellent examination results in the board exams held in previous years. The school aims at imparting sound intellectual, moral and physical education to the students. It aims at inculcating leadership qualities, high moral character and a sense of discipline among the students. The School is affiliated to the Central Board of Secondary Education, registered under the Societies Registration Act XXI of 1860, and is run under the supervision of a Trust, all of whose members are highly qualified educationalists from different walks of public life. The Trust body reserves the right to change, amend or remove any part of this prospectus without assigning any reason thereof.